No. 2 & No. 5 is an A5 b/w zine released on the occasion of 'Not Available in Good Bookshops,' a book fair of alternative publishing held as part of Sluice Biennial 2017 between Sept 30 - Oct 3 in London, UK. The work was originally shown as part of ppm#2 copy art show, organised by Aici Acolo Pop Up Gallery, Cluj-Napoca on March 30, 2017. 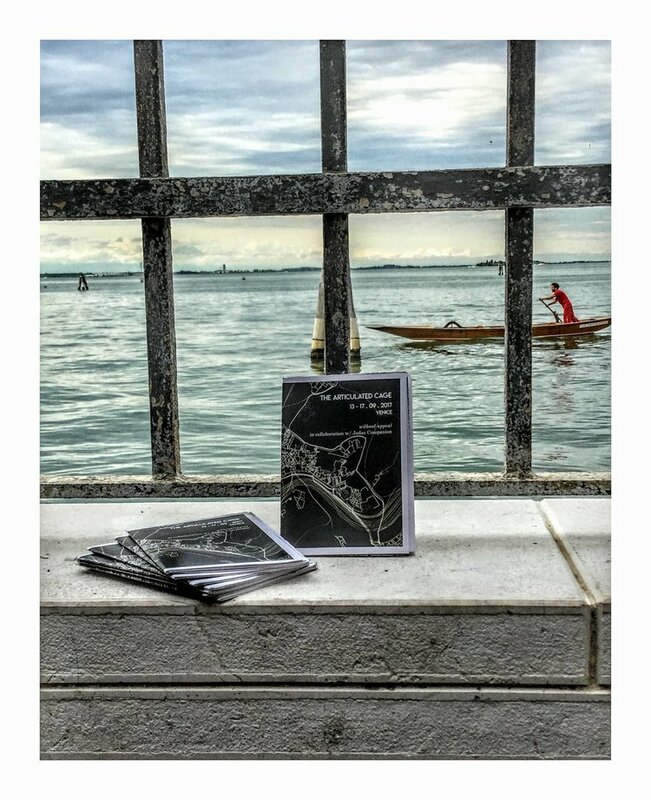 'WA003 - The Articulated Cage' is an A6 fold out zine/poster, handed out free between September 13-17, 2017 during the closing months of the 56th International Art Exhibition at the Venice Biennale. 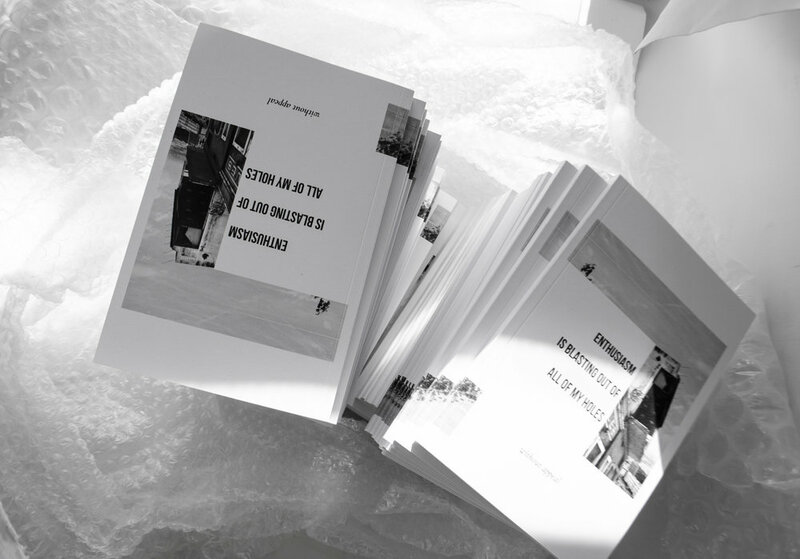 The project served as a publishing intervention, wherein the collective established itself as a kind of nomadic pavilion moving amongst the other established participants of the Biennale. Central to this was a series of t-shirts co-designed by without appeal and London based fashion label Judas Companion that functioned as a uniform, establishing a particular methodology to our work in Venice. On November 26th, 2016, without appeal formed a temporary collective with Raluca Branea in order to conduct an intervention within an old apartment building in Earl's Court, London. At the time, the premises was under the management of Art Guard, a non-profit organisation of property guardians with a specific focus on providing live/work spaces for artists and other cultural producers in the capital. The event was extensively documented and has now been published by without appeal as a colour newspaper in an edition of 50, offering details about the intervention and exclusive artists' spreads featuring work from all the participants. "Only figures on the margins of a field can bring its blind spots to the fore. The field itself is pulled into visibility by those whose status within in is unclear, seeming to be both inside and outside it at the same time, whether it be outsiders visiting the inside, insiders drifting outside, or those simply who venture too deep inside." The first was the installation of Case Study, v.1 in one of the apartments. This mixed media work reflected on recent conversations about perceived current conditions of artistic production and circulation, creating a framework for the subsequent acts. In this setting, Home Practice took place on the balcony of the same apartment; a performance wherein Raluca Branea and Lia Boscu, mirroring each other, performed an intuitive rendering of a collective text - a transcript of this text will be printed in the upcoming publication. The action was focused on the windows, understood as a permeable membrane – a place of contact and exchange between the inside and outside. Considered as such, the window becomes a surface where the tensions associated with the geometrical delimitations of in/out are in constant flux. After Home Practice, an engaged discussion between the participants continued the dialogue started in the performance and provoked a visible alteration to the diagram on the wall, generating a second version of the work, Case Study, v.2. A screening of two short film works by Will Gresson on the window of the apartment below, only visible from outside concluded the intervention. The videos considered these notions of temporary and in-between spaces by juxtaposing two experiences of being in transit and exploring their potential as sites of artistic production. The first project realised under the banner of without appeal is a 7" acetate record cut by Peter King in Ashburton, New Zealand in late 2016. Featuring new music from Sferics and The Old Dream of Symmetry, the record is being released in a super limited run of 20, as well as digitally. A Cloud the Size of the World is an exploration of a complicated love-hate relationship with loops, a personal search for something lush and hazy with a more dynamic feel than traditional looping. The title echoes somewhat the process of producing the track - paying attention to the subtle changes of colour and shapes, similar to watching a cloud for a long time. [between parentheses] originally began as a more conventional guitar/drums arrangement before much of it was reworked using a single sample, digitally altered and then multi-tracked. The result was much a simpler and more direct sound, less grounded in something recognisable. The song was written for a family member who passed away in 2o12. Both tracks underwent long periods of development, and although they're dynamically quite different they nonetheless function as two sides of the same conversation. The record's cover image was taken in Bucharest, Romania during a short research trip in 2014. It marks a point where certain ideas slowly began to develop, which ultimately led us to the creation of without appeal two years later. The Old Dream of Symmetry is Will Gresson. Artwork by Lia Boscu & Will Gresson.